Ookibloks is a charmingly fast-paced arcade-style puzzle game. And it's fun, too. Charmingly vibrant and cute in a way that's reminiscent of arcade puzzlers of old, Ookibloks might not be perfect but it's got plenty about it to encourage one to keep on playing. Players control a lost monkey called Ooki who is attempting to reclaim an island from various aggressive creatures. It sounds potentially violent but it really isn't. 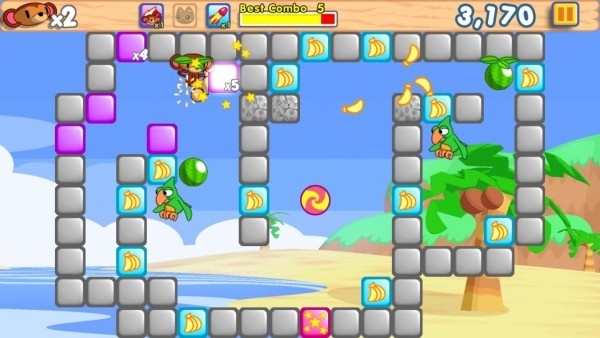 Instead, gameplay is mostly about bouncing between different blocks, collecting bananas, and knocking crabs and other bad guys out with pieces of fruit. Like all good puzzle games it's simple to learn but quite challenging to master. Controls are purely of the swiping variety with Ooki bounding around hitting banana tiles in order to collect them. It's not possible to change his trajectory once he's in motion so it's important to get him in the right position before sending him off down a level. It's even more important when encountering various creatures out to stop him. Ooki loses a life the moment he clashes with such creatures, meaning it's wise to plan carefully. In juxtaposition to such careful planning, players are rewarded through a multiplier system to react quickly. 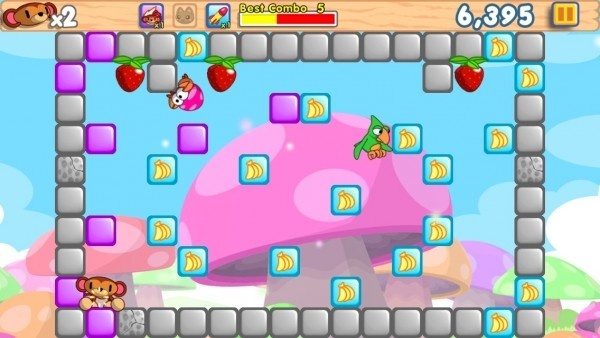 Collect plenty of bananas in a matter of seconds and the points go up significantly. Similarly, the music of Ookibloks encourages speedy reactions. It's a fast-paced mix that works well thanks to the game's snappy control scheme. Throw in daily challenges and the Endless Banana Chase mode and there's plenty to enjoy here. What doesn't always work so well is the annoying series of adverts that fund this free game. Often requiring 30 seconds of video, it messes up the momentum that Ookibloks builds so well. Still, for $0.99, players can remove the adverts as well as gain some coins to be used for power-ups, making things a little easier for a time. I'd heartily recommend it as the adverts really do irritate, plus Ookibloks is worth the $0.99. Well made and with plenty of longevity, it's easy to be beguiled by Ookibloks's charming nature.